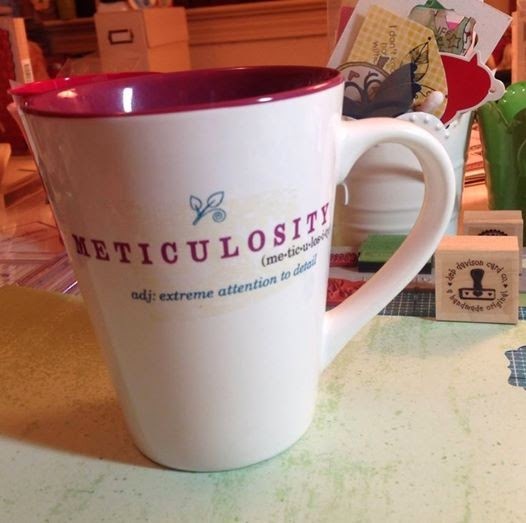 In 2006, I bought a coffee cup with the word "Meticulosity" on it. Having been a bit OCD my entire life, the definition spoke to me.. "Extreme attention to detail" .. Having worked as a Critical Care RN for a very long time, I paid extreme attention to detail on a daily basis. It crossed over into my "play" time as well when I would be creating cards.. A love of stickers as a child morphed into a LOVE of card-making as an adult. Ribbon, twine, patterned paper, rubber stamps, ink pads - they are all supplies I pay extreme attention to when I am choosing a design for my cards. My intention in starting this blog is to share my creative side. I will share cards I have made, artsy-craftsy books that I love and ideas that I have.. I hope you like what I have to say. I am excited to get started on this journey....... I hope you will join me..